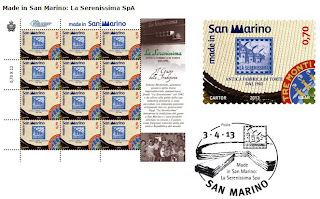 “Made in San Marino” is the serie dedicated to the most representative products of San Marino. 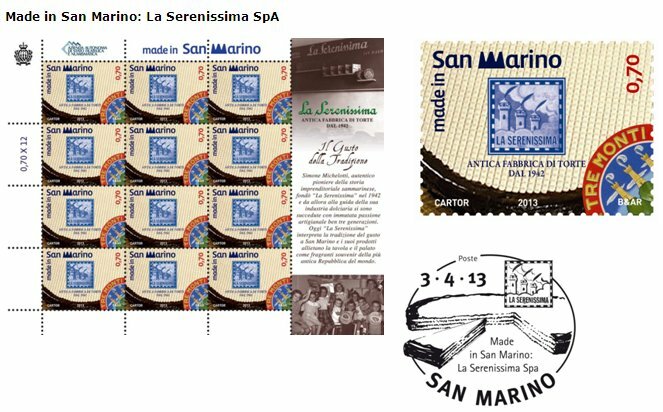 La Serenissima is an old company which was founded in 1942. The stamp of € 0.70 was designed by B&AR. In the foreground the typical cake of San Marino “Tre Monti”. In the left corner a suggestive coat of arms which reminds the traditional cake. In the centre the logo of the company, made up by three towers and three panaches. Seventy years of skill, creativity and deliciousness. Michelotti family, the owner, received a prize in 2011 by TuttoFood, the most known food exhibition. AASFN decided to render homage to this traditional product.